A Take on the 2016 AmLaw 100 - Adam Smith, Esq. Compared to what we were once used to, BigLaw’s 2015 financial results can pithily be described as “crummy”—at least as reported in the just-released 2016 AmLaw 100 figures. We won’t go into the reality-TV zone of which particular firms were up and which were down except to observe that the biggest individual moves in top-line numbers like revenue and headcount (Morgan Lewis and Locke Lord) were driven by mergers. Results for other standout winners and losers tend to be driven by circumstances unique to each firm and as such embody little learning for the rest of us, no matter how much drama the outlying firms had to go through to produce their numbers. However, this year will finally be the one where we commission a gas chromatography analysis of the water in Wachtell’s offices: How on earth do those guys do it? 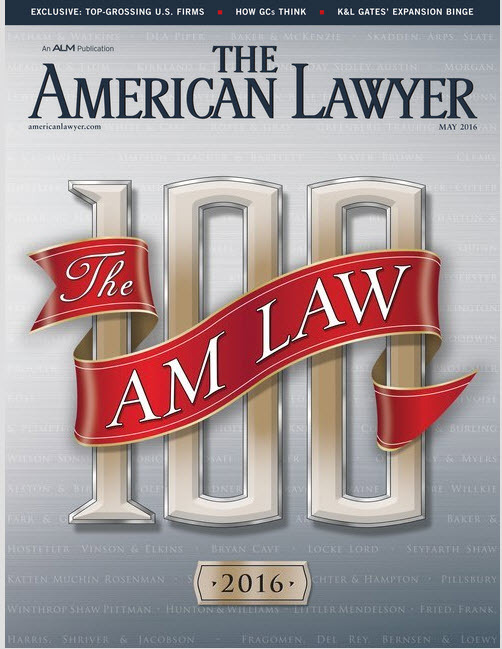 We take an even more sober view: Half-buried in the detail is the eye-opening fact that, excluding the Great Meltdown years of 2008 and 2009, these were the worst results for the AmLaw 100 in nearly 25 years—going back to 1993, when we lived in a very different world. The equity partner numbers do, however, signal a far more important story: In our opinion the most important single piece of data, bar none. That’s that calculated ranks of equity partners actually declined by -0.6%. To us, this is the buried headline: It reveals a business model embodying a traditional career path under severe stress. To begin with, if you’re an AmLaw 100 associate, this signals that your prospects of partnership just went from dim to laughable; someone’s going to have to die (or retire) first. But more fundamentally, we read this as delivering the clear message that it’s time to retire the “tournament” model of BigLaw careers from its decades of faithful service. Whatever new rules of the game emerge to replace it have yet to be written. And because BigLaw lives and dies through its talent, we submit that nothing could be more urgent. It’s not being alarmist to say firms ignore this at their peril. Now, to the question everyone’s dying to ask: When is it all going to get better? We take no glee whatsoever in responding, “on the present course, never.” This year’s AmLaw figures are clearly of a continuum with their predecessors in this series since the Meltdown (and there were signals of market maturity and the concomitant stagnation it entails before that). For the results to be dramatically different, we may need to…do things differently. But whether firms actually will change their business model, on the recognition that expecting different results from the extant model may have passed its expiration date, depends not in the least on the clear message we think this data series has been delivering for nearly a decade. It depends on something else altogether: How and whether firms are able to overcome the tremendous forces of internal inertia and stasis that build up in successful organizations. Especially organizations owned and operated by ranks of breathtakingly skeptical and financially comfortable people with short career or firm-loyalty time horizons. We provided this article to Thomson Reuters’ Legal Executive Institute yesterday and we appreciate their kind permission to republish it here. Bruce – thanks again for your insight. Bruce: I expect better from you. First, averages don’t lie or mislead. They are simple arithmetic computations with well known limitations. When we want to know more than the average (mean) will tell us, we compute the median, standard deviation or other statistics that will tell us more about the distribution of the observations under study. The problem here is that AmLaw presents only the most simple statistics. Second, having criticized the use of averages as misleading you fall into essentially the same trap when look at the reduction in the number of equity partners and conclude that it is getting harder to make equity partner. But the number you report is a net change (additions to the equity ranks less deletions). While deletions exceeded additions last year (by just over one partner per firm) the net number tells you nothing about how hard it is to make equity partners. If there are larger number of additions and deletions, it might actually be getting easier to make equity partner. Anecdotally, we know that AmLaw firms have been culling the equity ranks, and not just through “retirements.” Partners are being de-equitized. But, as with the first point, AmLaw doesn’t report additions and deletions, only the net change so don’t know from AmLaw numbers whether it is getting harder or easier. That said, I still really like your analysis and hope you will have further observations after digging further into the data. Many thanks for your comments, which I have to agree are well-taken. By way of explanation but not excuse, I was asked to pen a take on the AmLaw 100 for Thomson Reuters (you see the shared attribution on my original column) but was given an 800 word limit. No, no excuse. Coincidentally, a few weeks ago I asked a researcher to calculate the mean and standard deviation of all worthwhile AmLaw data series for each year going back to inception. I don’t have the results yet but I’ll give you three guesses where you’ll be able to read about them…. Your point about the number of equity partners (as AmLaw counts them, of course, which is often at odds with the ways firms count them internally) is well taken. It’s entirely possible the revolving door, if you will, has accelerated in velocity making it easier to “make” the equity ranks and easier to be evicted from them. It’s at odds with what I’m hearing anecdotally (to wit that it’s harder to join and easier to be evicted) but those are anecdotes and not data. Another research project!